Two aspects of a truncated INP fusion protein can be analyzed for normal functionality. Protein folding: to visualize correct folding of the protein we also fused, instead of the mSA2 protein, the mGFPuv2 protein to INP(RC). Deionized water was super-cooled to approximately -10°C in a cooled 50% glycerol water bath. In the same tube, first 50 µL of lysate containing mGFPuv2 was added and subsequently 50 µL of one of the lysates with a INP(NC)-fusion protein. To prove the ice nucleation reaction is not just caused by increasing the volume from 50 to 100 µL with any lysate, 50 µL of the lysate containing mGFPuv2 was also added multiple times to the same tube. The fusion with mGFPuv2 exhibits fluorescence and both the lysates with INP(RC)-mSA2 and mGFPuv2 were active as a nucleus for ice formation. 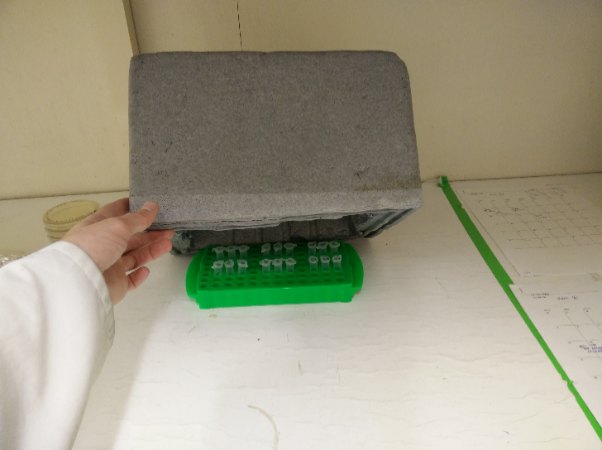 In this project a protein was attached to a PLA surface by taking advantage of the strong biotin-streptavidin binding. 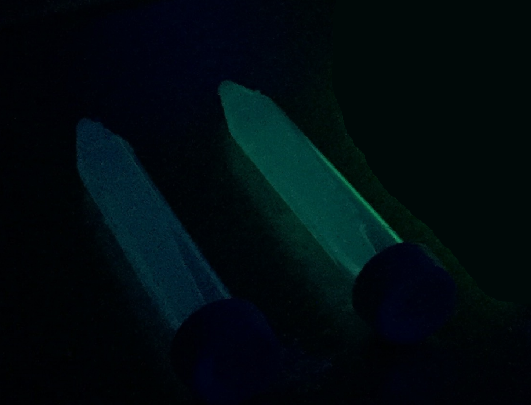 To prove the proteins do indeed stick to the filament, one option is to make fusion proteins containing both streptavidin and a fluorescent protein. This was tested in 2 different setups. On one hand the biotin impregnated filament was used (Filament page, Method 2) and on the other hand glass slides coated with PLA and biotin as described on the Filament page, Method 3. In the following picture (A), the filaments labeled with ‘10’ are coated with the mSA2-mGFUuv2 protein and filaments labeled “11” with mGFPuv2. Under UV light, there was no green color visible for either protein coatings. In the picture B, the same lysates are applied to PLA + biotin coated glass slides. Here we clearly see under UV light that the mSA2-mGFPuv2 (left slide) sticks to the surface while the mGFPuv2 does not (right slide). This tells us that making fusion proteins which include a fluorescent protein can work in some cases to prove the presence of a protein of interest, but clearly the method was not sensitive enough in case of our filament and creating fusion proteins to prove the binding of a protein can be very labor intensive. Because of the results with the fluorescent protein, a second, more sensitive method was though of which makes use of antibodies and an enzymatic reaction. Here we do not rely on the color/fluorescence of a protein itself for detection but on a color coming from an enzymatic reaction. 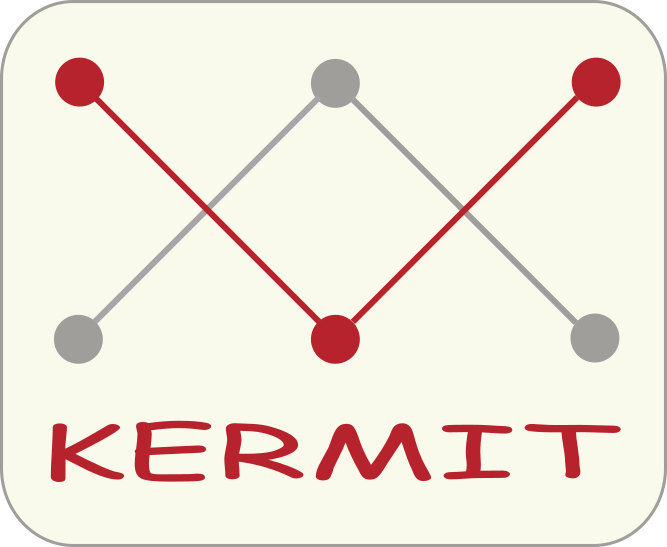 Because many substrate molecules can be converted into a color by one enzyme, this intensifies the signal enormously. 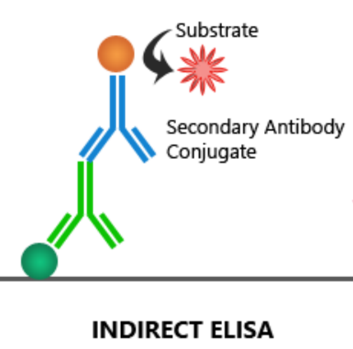 The method is a customized ELISA protocol that can be adapted to detect any protein on any (3D printed) PLA structure without the requirement of an extra protein being fused to the protein of interest. Lysates containing the protein of interest are prepared as described previously (SOP page). Filaments are incubated overnight in different lysates on a shaker at 80 rpm in a cold room. The filament is washed 3x 5 minutes in 3 mL PBS + 0.2% Triton X100 in 15 mL tubes on a shaker at slow speed to remove non-attached protein. The washing buffer is discarded in between washing steps. 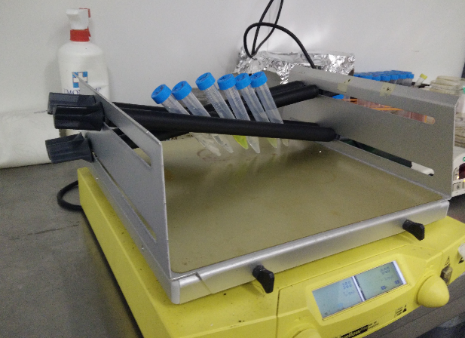 The first antibody is applied by incubating the filament 2 hours on the shaker in 3 mL antibody + PBS + 0.2% Triton X100. In this specific case, a mouse antibody targeting the His-tag (attached to streptavidin) is used. Repeat step 1 for washing non-attached antibody away. 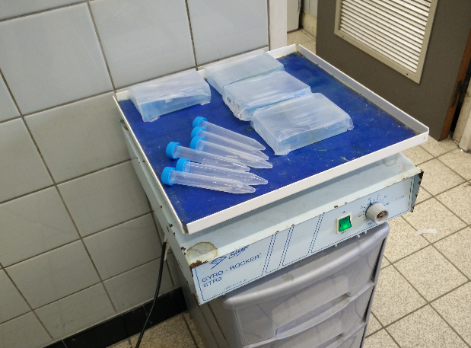 The second antibody (anti-mouse, goat) is applied again in the same buffer and incubated on the shaker for 1 hour. Multiple of these goat antibodies can interact with a single primary antibody, which improves the sensitivity of the method. Wash again for 3x 5 minutes in PBS to get rid of non-attached antibodies and the Triton X100. 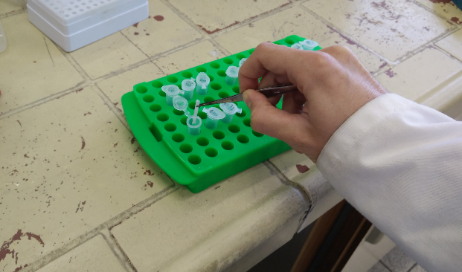 Each piece of filament is now transferred to a 2 mL tube for the final step in which an added substrate is converted to a colored molecule by a phosphatase linked to the secondary antibodies. 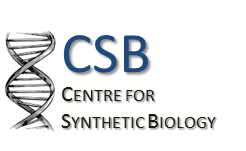 The substrate containing solution consists of 50 µL NBT/BCIP in 10 mL 10mM Tris (pH9.5), 100mM NaCL and 50mM MgCl. To each 2 mL tube, 1.5 mL of the solution is added. The results are displayed in the following picture. The tested proteins were mGFPuv2, mGFPuv2-Strep and mGFPuv2-mSA2. The 2 streptavidin variants were designed with a Histag, with future purification in mind, and was used as a target for the primary antibodies. As well normal PLA as biotin impregnated PLA was used for the experiment. As expected we don’t see any/little coloring on the normal PLA filaments since no protein should attach without the biotin present. As for the biotinylated PLA, the two Histag containing proteins are indeed colored as expected. Unfortunately the PLA with the mGFPuv applied also resulted in a colored filament. This is most likely caused by pores in our filament in which the antibodies got stuck. This could be solved by incubating the filament with casein protein (analogous to Western Blotting) to block any pores. In conclusion, we can say that the customized ELISA protocol is indeed an effective method to intensely color a PLA structure for sensitive detection of protein. By a pretreatment with casein we can most likely solve the selectivity issue which makes the method look very promising.